In New England, people take St. Patrick’s Day seriously. The holiday is a day of pride for the local Irish population and an excellent excuse for drinking for the rest of the population. It’s too bad that St. Patrick’s Day is usually commemorated with drunkenness and garishly commercialized leprechaun decorations. No use complaining, though. I took time out of my day to cook some more-or-less Irish dishes and reading The Celtic Way of Prayer: The Recovery of the Religious Imagination by Esther De Waal. A picture from my trip to Ireland several years back. In my experience, Irish food does not exciting adoration. Fish and chips are fine, so is boxty and soda bread, but not really anything to write home about. Let’s face it, it’s not particularly healthy, either. So we cooked a meal of comfort food, heavy on potatoes, cabbage, and stewed meat, to celebrate a culture and a people that have ingrained themselves in New England’s general consciousness. On the menu? Colcannon and corned beef with vegetables. As I don’t eat beef and my mother took care of that dish anyway, we’ll just be looking at colcannon. 1. Bring water to boil, adding 1/2 teaspoon salt. Scrub the potatoes, removing the eyes and any patches of thick skin, then chop them. Once the water boils, add the potatoes, cover, and let cook for 10 minutes or until soft. 2. Drain the potatoes, then let them air dry. You can speed the process with a towel if need be–the drier the potatoes are when you move to step four, the better. 3. While the potatoes dry, put the half and half, milk, and half of the stick of butter in the pot you just removed the potatoes from. Let the milk warm and the butter melt. 4. Once the butter has melted, add the potatoes back in to the pot. Turn off the burner. Stir, then mash the potatoes to your preferred smoothness. Add 1/2 teaspoon of salt and cracked pepper to taste. 5. Add two teaspoons of butter to a fry pan and add the cabbage and onion. Cook until translucent. 6. Once the vegetables are cooked, add the mixture to the potatoes and fold in. Add more salt and pepper to taste. 7. Brown the other half of the stick of butter. 8. 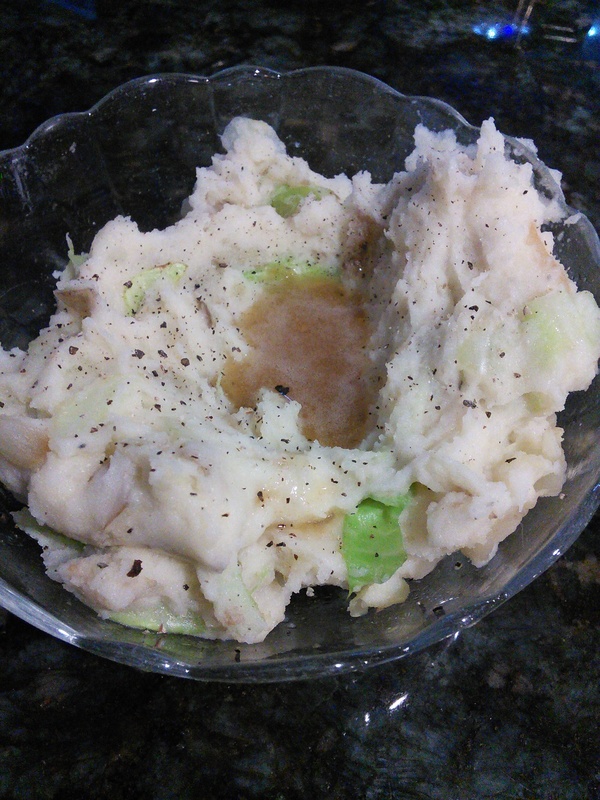 Serve: Spoon colcannon onto plates, denting the top with a spoon. Fill the indentation with the browned butter. The night of a holiday is a bit late to be recommending books, I know, but How the Irish Saved Civilization is a fascinating read if you’re interested in learning more about the Irish that Patrick served. If you haven’t seen the stunningly animated children’s film The Secret of Kells yet, I highly recommend it as well. I’ve got a lot of passions. Travel. Eating food. Cooking food. Culinary anthropology. Computer Science. Sustainable living. Languages. Obscure fandoms. 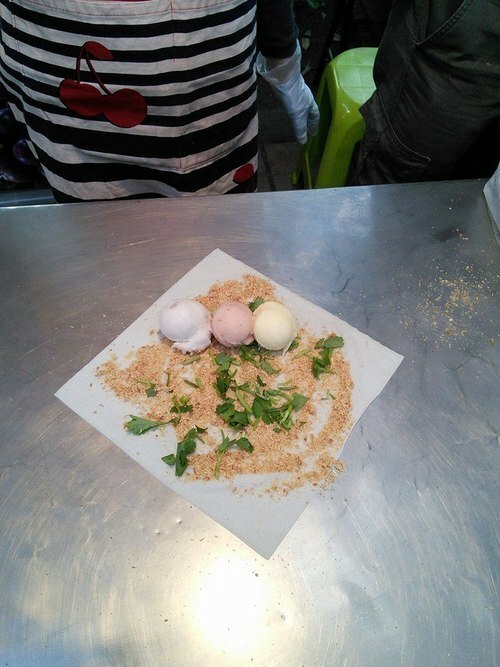 This new blog is to chronicle any of these interests, as long as they collide around food. So what’s on the proverbial menu? 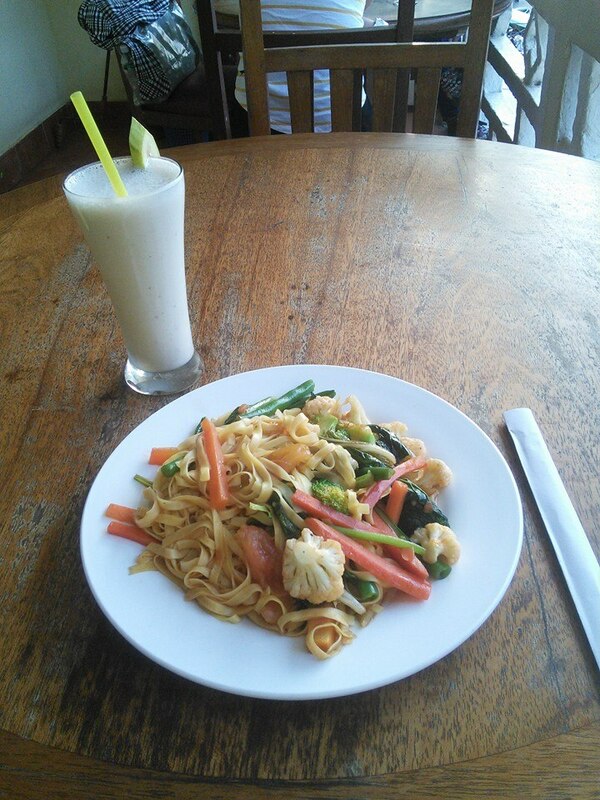 Khmer noodles and a banana milk. Maybe you know about New York Pizza, sushi in Tokyo, and fried cornbread in the American South. But have you heard of Tainan, Taiwan’s quintessential food town? Do you know the difference between Mexican, New Mexican, and Tex Mex? What Navajo dishes can you eat in Albuquerque? 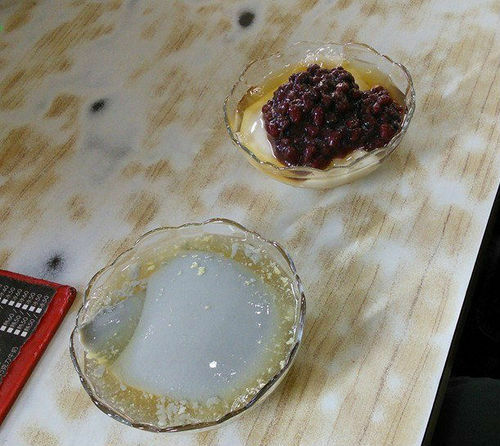 What’s up with Taiwan’s drink sweetness levels and Tokyo’s obsession with theme restaurants? 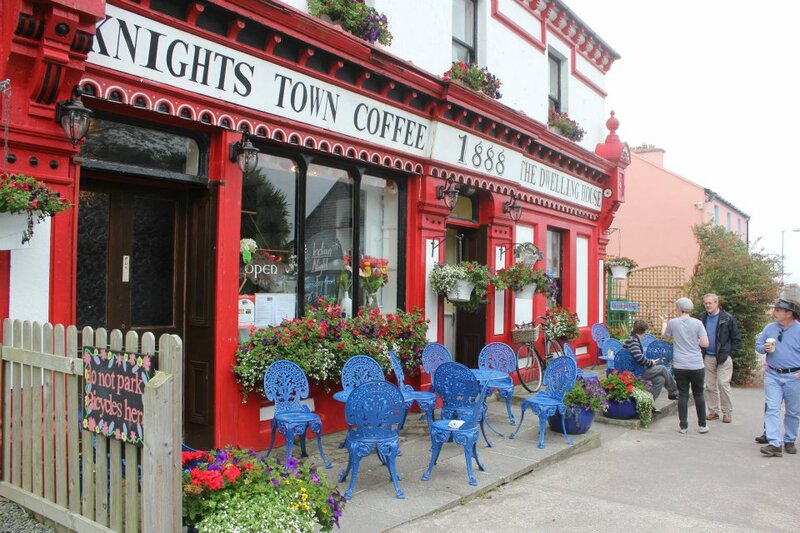 Is there a difference between Irish and English breakfast tea? Place posts seek answers to these questions. 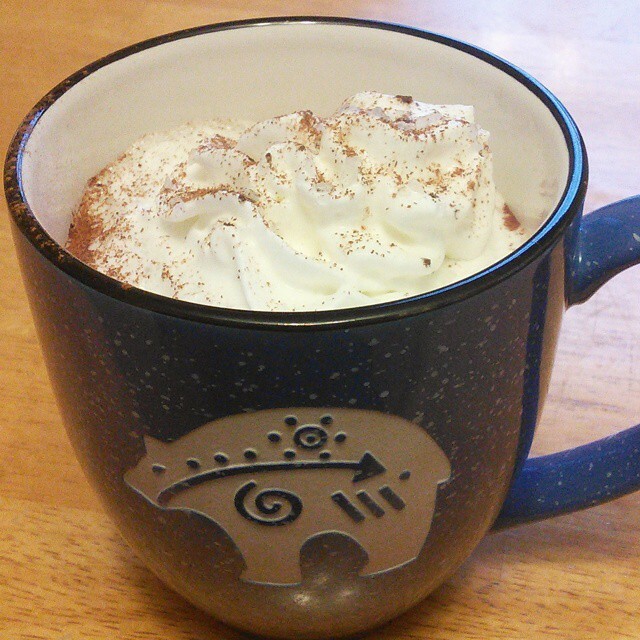 I’m seeking lots of things at this point in my life, but decadent gourmet cup of hot chocolate is very high on my list. As is the ability to make a souffle. And a perfect cup of breakfast tea. Cooking experiments are where I learn what not to do through experimentation, and relay that information to you in a manner that doesn’t involve you dirtying dishes for a cup of clumpy chocolate. There’s this dish I had in Taiwan that’s unlike anything I’d had before or since. But I can’t google a recipe, because I have no idea what it’s called. 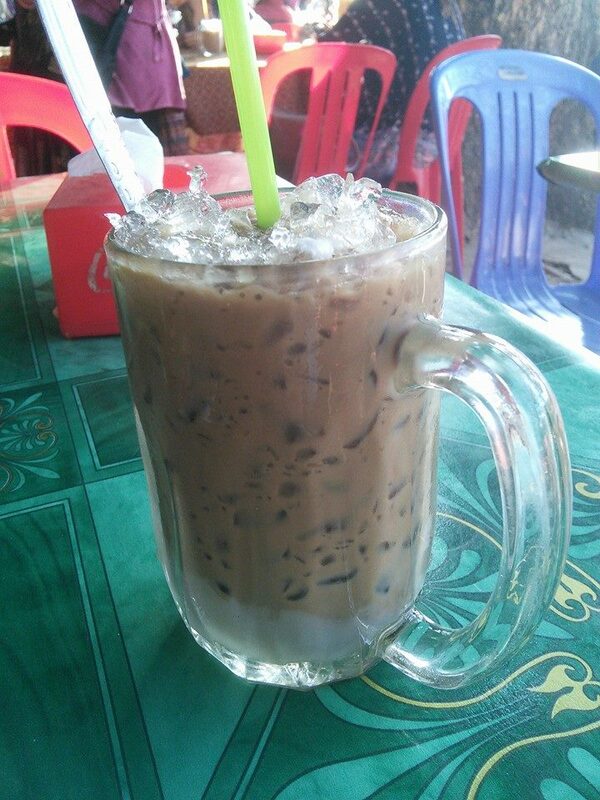 Cambodian iced coffee is to die for, but how to I recreate that specific sweet creaminess? Once I crack a copycat recipe, I’ll post it here. 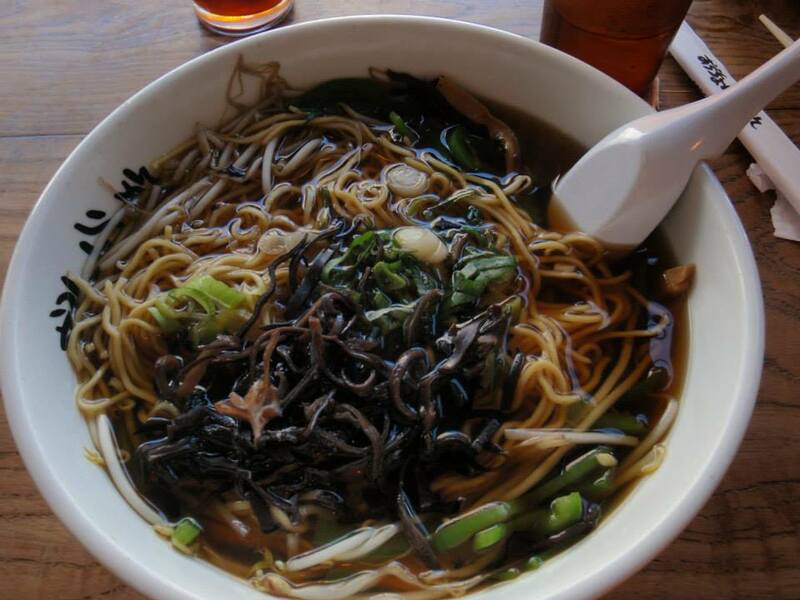 Vegetarian Ramen in Little Tokyo, Los Angeles. Where in Albuquerque can you get actual New Mexican? Is it possible to eat a good Taiwanese supper on the east coast? As I travel, I’ll keep track of what I eat and where I eat it, to serve as a reference for those of you who may one day find yourself craving Mexican food in Ireland. 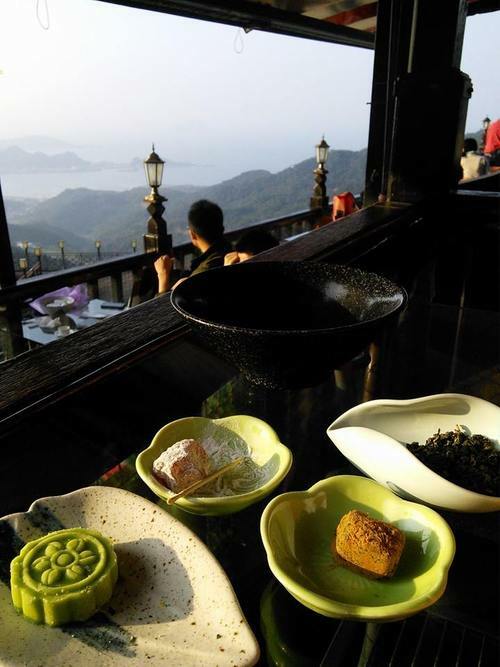 How do they make tea in the scenic mountain tea houses in Jiufen? How do you scavenge for autumn berries, and what do you do once you’ve got them? How do you shop for Indian spices in the US? Instructionals go beyond recipes to guides and techniques for dishes or cuisines. 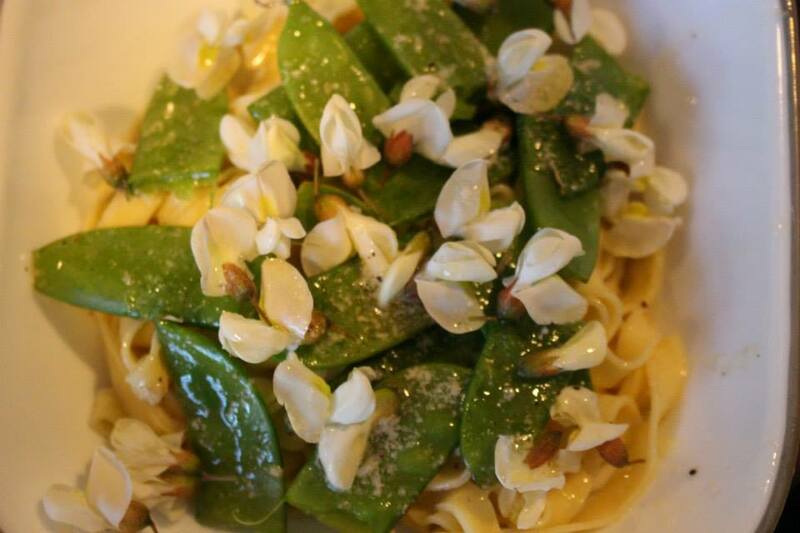 Black Locust Flower and Snap Pea Noodles. I don’t come up with too many recipes out of the blue. Usually my recipes are a product of tweaking, copy-catting, and dumb luck. But sometimes, I strike gold, or at least passable silver. When that happens, you’ll be the first to hear. Guatemala is a strange place to start a story about Taiwan, but humor me for a moment. This summer I spent three weeks in Guatemala, and two of those were at a Spanish school in Antigua. One of my host sisters was a Taiwanese-Australian woman who had been in Canada for the last several months. “I’m moving to Taiwan in September,” I told her. She, through a wondrous coincidence, just happened to be moving back to Taiwan herself. I didn’t see her at all through the first semester, but as soon as my last final ended, I packed up and headed to her house in Kaohsiung for a packed weekend. 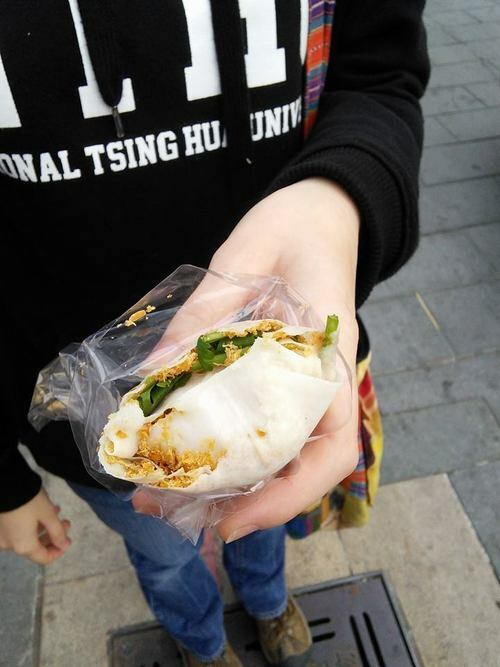 I had some fantastic food in Kaohsiung, but the real highlights occurred on a lightning-fast tour of Tainan. Tainan is known for its food: fresh, unique dishes that practically define a trip to Southern Taiwan. We made the 40 minute trip north by local train, then met one of Elly’s friends from Canada for an insider’s tour. To whet our appetites we started off with winter melon tea. We ordered it half-sugar and it was still intensely sweet. 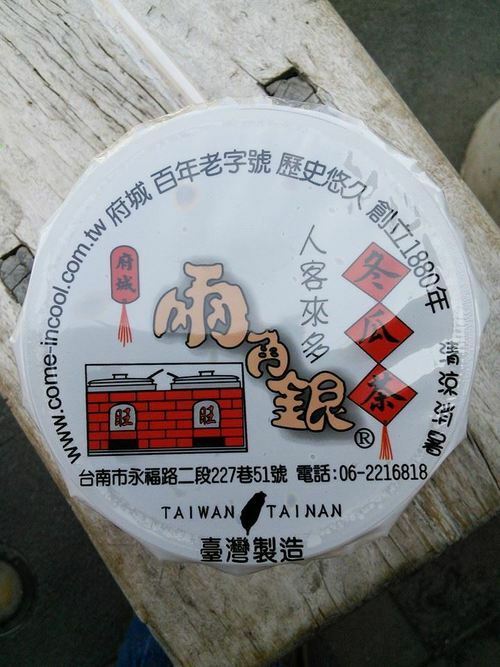 Apparently, winter melon tea (known elsewhere as “winter melon punch”) is quintessentially “Tainan”. It was tasty, but I would have preferred it with ice and no sugar. Winter Melon Tea at Two Silver Cents Traditional Winter Melon Tea Shop (link). Next, how about something substantial? 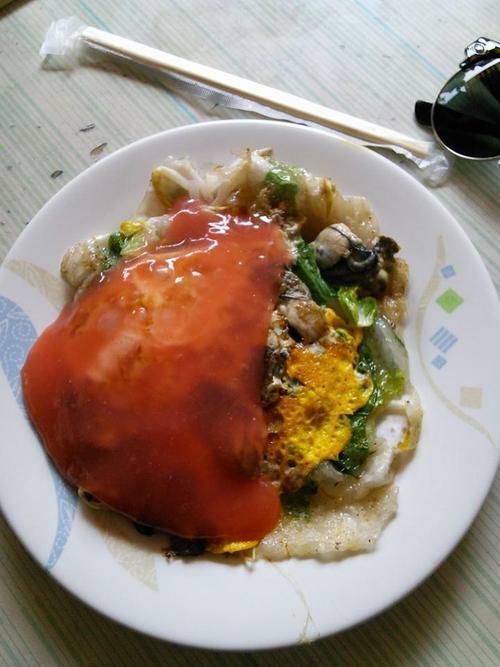 What you see below is an oyster omelette. It’s a spoonful of oysters tossed on the griddle with an egg cracked over them, a hand full of lettuce and bean sprouts, a huge dollop of sweet and sour sauce, and what was described to me as “gluten”. Just…gluten. I’m not sure what it was, but it was tasteless and chewy and probably isn’t safe for anyone with celiac. 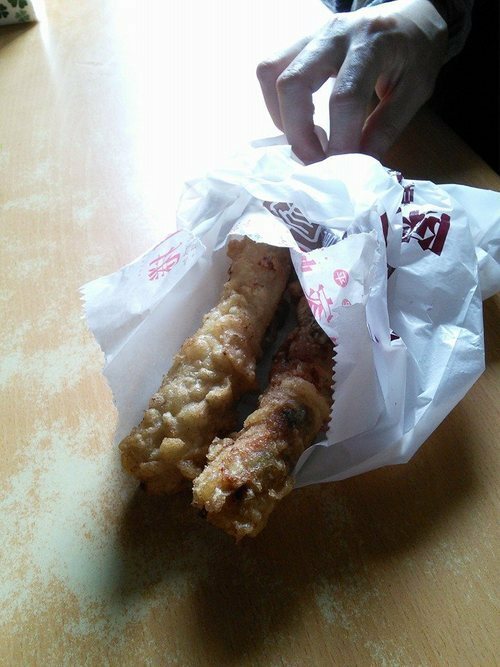 It also looked like placenta, so you should probably also skip it if you have an active imagination and a weak stomach. Let’s break down this dish: the pink stuff is a mild sweet-and-sour sauce, the yellow is egg,the gloopy white stuff towards the bottom right is gluten, the bubbly grey and black things near the top right are oysters, and bean sprouts and lettuce (I think) are seen throughout. It was filling. Really filling. Whatever the “gluten” is, it sticks to your ribs. But there’s always more food to be had in Tainan, so we move onward. There is a theme that you’ll see developing: most of the food here looks disgusting and tastes incredible, or sounds bizarre but is actually tasty. Case in point: tofu pudding. The bottom bowl, the one that looks like clay floating in mucus? Not too sweet with a delicate lemony taste. Would certainly order again. Tastes nothing like clay floating in mucus. This next thing I didn’t actually eat. It’s a style of ice cream cone that apparently came from Korea. Chocolate goes in one side, and vanilla in the other. This shop had long lines out front and a rack of rejects for photo ops. Thanks to Elly for taking pictures of me! 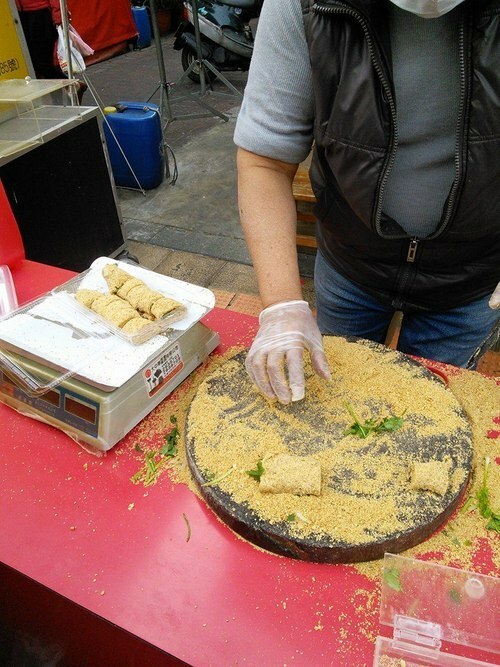 The man in the next picture is using strips of peanut brittle dough to make rolls. Who decided that peanut brittle should be crushed into meal, rolled around cilantro, and sold? Who knows, but they were onto something. The stuff’s pretty good. The combination sounds bizarre, but it’s actually really, really good. My only gripe is with Taiwanese ice cream, because for some reason it’s always more icy than creamy. But you can’t get taro ice cream in the States, so I’m not complaining too much. After a few hours, you get to a point where you just can’t cram anything else into your stomach. Don’t let the pictures (or my descriptions) scare you. If you’re in Taiwan, Tainan is worth the trip. In the future, I hope to expand upon this post and try to recreate some dishes from Tainan and the rest of Taiwan. Note: An alternate version of this post was originally published on my travel blog. Enter your email to follow Taste Test Travel and receive notifications of new posts by email. 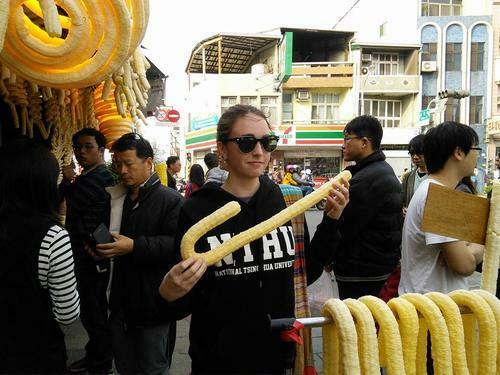 I'm Renee, lover of travel and regional foods. This blog is for chronicling my cooking experiments, writing about foods I find when I'm traveling, and celebrating interesting dishes. Out on the town with @l.currie and @osborn_to_hike today. This poor little birdie is spending the night. Housemates found it injured in the driveway and made a little home until the wildlife center opens in the AM. UPDATE: It's a pine siskin, and it's at the rehab center! A shower! A day off! A soft bed in a house that just happens to be situated a quarter mile from the library!